It will be worth keeping an eye on Gold and following its price action both closely and carefully. Try and monitor how it behaves on certain news. Try and see if it behaves like you think it will or actually the opposite? US news both positive and negative is a driver for Gold price action in my experience. Watch the US Dollar along with Gold and what how they both behave. The recent rise in Gold prices has not continued. Now in my experience this could be simply down to short covering activity. This is an assumption by me as I do not know for sure but it would not surprise me. To me the short term trend is down. There will be a lot of traders using technical analysis to predict / assume how the price will react. The market knows and understands this. The professional traders know this. The best Commodity Hedge Funds know this and is most likely to be programmed into their trading system. As a result I am not expecting Gold to follow the conventional rules that technical traders will be hoping for in terms of Fibonacci retracements, etc. Now I could be wrong so I will use this opportunity to test my assumption by following the price action to see how Gold's price behaves and what happens. So any day trade from this morning at 5:00 am and any close from say 5:00 pm so 12 hour hold would have resulted in a profit. There could be further votes on Brexit tomorrow and Thursday so Gold and Silver along with Bonds will be very interesting. In about 40 minutes we shall get the results from the voting today so my eyes will be on Gold and Silver and how they react to the results of the vote. At 5:00 am, Gold is performing a lot stronger than Silver. 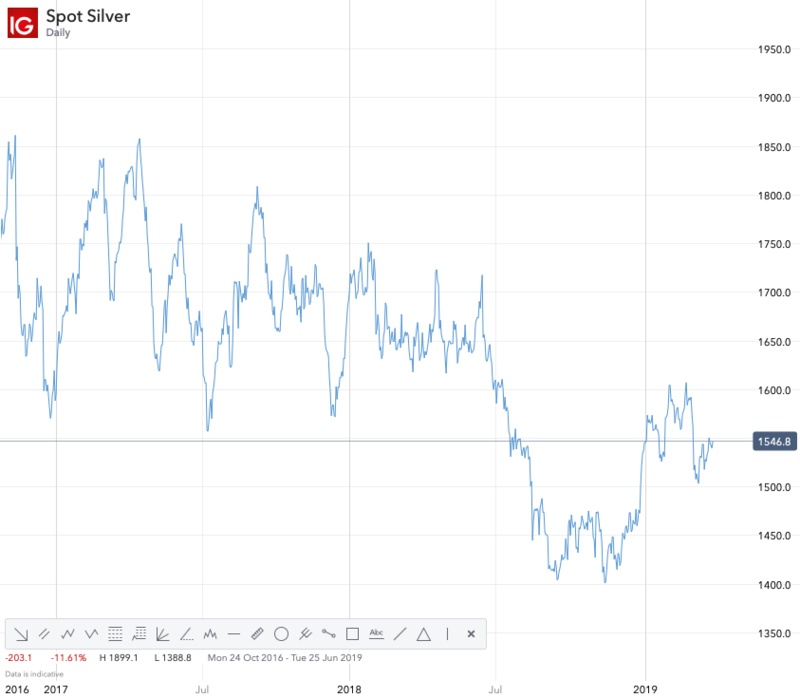 With the Brexit uncertainty and another vote today on No-Deal Brexit, it is taking the lead and showing Silver the way. I think Gold will remain positive while the Brexit uncertainty lingers. The mere fact that it is staying above $1300 is positive. What I find interesting is that an IG Analyst provided its usual if Gold goes above x price then it will be bullish and if it goes below x price then it will be bearish with a chart stuck in there too! Surely that IG Analyst must know about the Brexit votes and how Gold could potentially behave but there was no mention of Brexit in the analysis which really does make me wonder of the worth of providing such analysis? With the second day of Brexit related voting in Parliament, Gold, has remained in its bullish tone. With a further third day of voting tomorrow I am expecting further uncertainly surrounding Brexit and Gold has a high probability chance of going beyond $1310. You asked me on Saturday if Gold would go above $1302. Well Gold's price action has answered your question. The question now remains how long is it going to hold there. I've seen many analysys where it's claimed to drop down between 1200 and 1250 lows to then seek another higher hights. It is 5:00 am and it is already down around 6 points. It went up to $1310.60 yesterday and is now trading at $1303.68. It seems the short term trend is manifesting its way downwards. I do not know how long it is going to hold there. I do not know how low Gold will go or how high it will go. The claims these analysts make are based on historical price behaviour which does not guarantee that Gold will act according to past behaviour going forwards. If it was that easy to predict future price action using technical analysis and past patterns and trends, we would all know when to trade that asset and when to go long and short. We would all be profitable majority of the time. Unfortunately it is not that easy. Gold is not obliged to follow any rules or conform to any technical analysis. That is not to suggest it will not do but I do not know. One can make assumptions which can then be tested by the price action or one can simply make predictions. There is nothing wrong with that as long as one makes clear that they are assumptions or predictions. 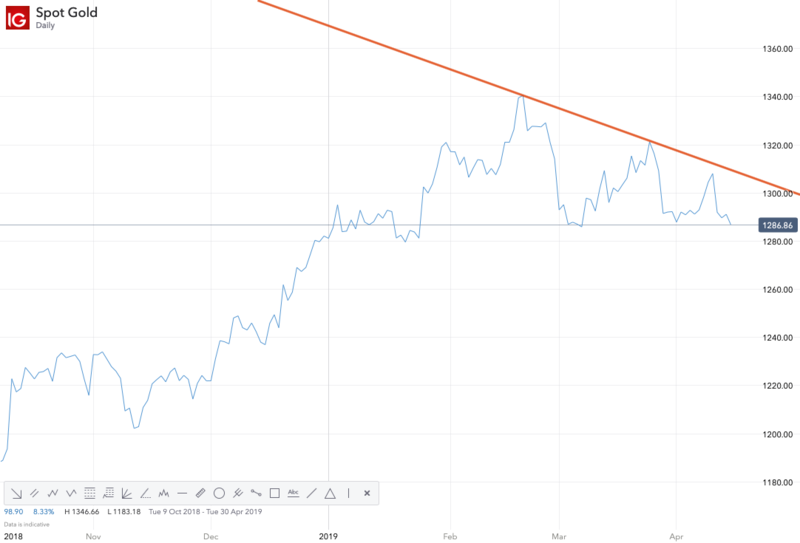 Gold continuing its current downtrend. A shorting opportunity presents itself! There will be different ways to play this short trade. One could day trade on the short side or hold until a counter trend back upwards is confirmed. There will be no right or wrong way but there seems to be a lot of selling pressure. Gold is trading below its 20 and 50 DMA’s. This presents a potentially bearish scenario. You can only make a decision on the price action in front of you and not what should or could happen. Silver is trading below its 20, 50 and 100 DMA’s. 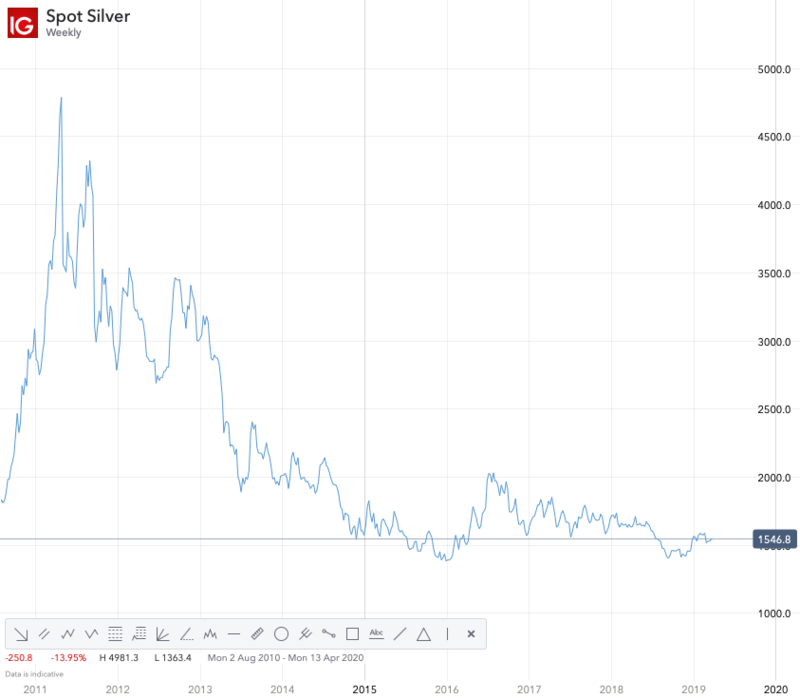 Silver tends to fall harder and quicker than Gold but not always. One could look into and consider either a short Silver trade or a short Gold trade with extra leverage. 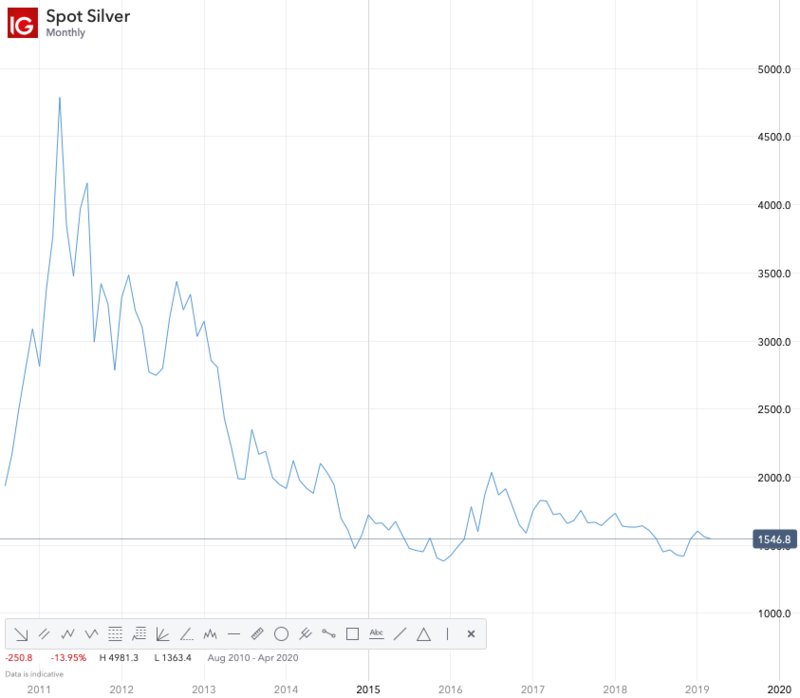 Currently for every one point in Silver you could using leverage trade two points in Gold and get similar if not at times better profit/points ratio. The risk is that this could reverse just as quickly should there be any news supporting Gold. The US Dollar will be a key indicator as will economic uncertainty in both the US and U.K.
One should not look to trade because I have suggested a possible shorting opportunity but should conduct the necesssry research and analysis and then come to an informed trading decision. If this is that my potential short trading idea is wrong then that is fine and then you would not consider going short. One cannot know for sure how long the bearish stance will remain and how far down it could go. It may reverse and go upwards tomorrow or next week. Lots of people are sending me messages asking me how far I think Gold will go down and the answer is that I do not know. I do not even need to know as part of my trading strategy. I do not have a crystal ball and cannot predict the future. My philosophy is the ride the trend until there is a large enough bend which triggers my trailing stop loss. With a potential Brexit delay looming and US - China trade announcement not going to be made for another month, uncertainty remains and still exists. It has merely been shifted towards a future time period. This means that the short term fundamental drivers and environment for Gold have shifted. This may be part of the reason why Gold is positive this morning around 5:00 a.m. UK time. SIlver is outperforming Gold at the time of writing this post. Even if you doubled the leverage on any Gold trade against any leverage used on Silver then Silver is still outperforming Gold this morning. I was wondering why Gold and Silver were not going up today with Bonds and Gilts performing rather well and major indices such as US declining. The US Federal Reserve released the 'not raising interest rates in 2019 news' and this pushed both Gold and Silver prices upwards. Gold and Silver have both started very positively and aggressively. The problem I have personally with Gold and Silver right now on the 'daily' chart is that the 'slopes' for the moving averages curves are all over the place for Silver. What concerns me in Gold is that the 20 DMA is sloping downwards. Now this may be due to the 20 DMA catching up with the current price move as it is a lagging indicator. Gold's moving averages seem to have more direction than Silver's at the moment. When looking at the Gold chart (daily) then I wonder if there has been a slight 'reset' since the large drop. Is Gold making new higher highs and new higher lows during the recent upturn since the drop? Both Bonds and Gold are up this morning. It seems they are going for a 'walk' together. Gold seems to be making new higher highs and new higher lows on this recent leg upwards. 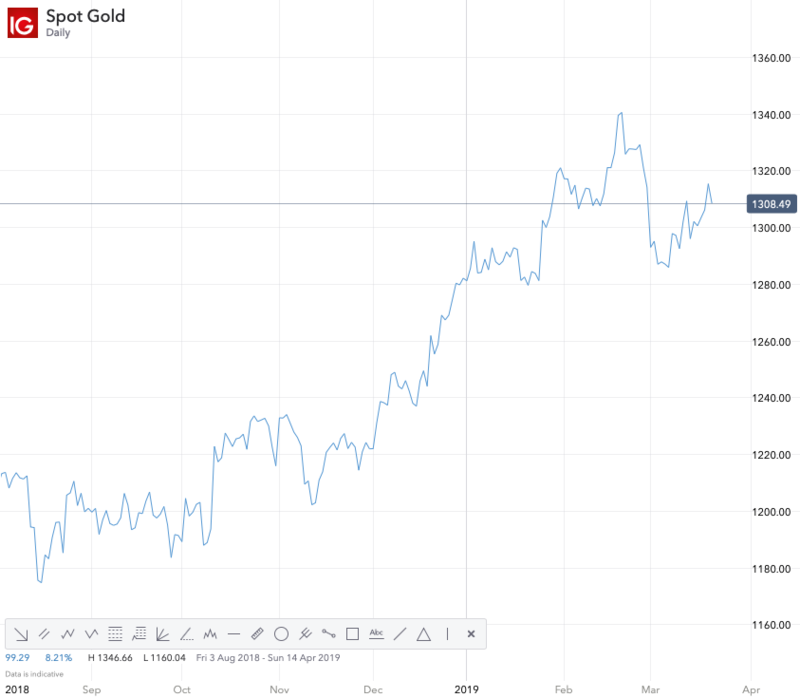 With a potential delay in Brexit causing continued uncertainty or no deal Brexit potentially causing disruption it offers Gold a temporary platform to rise. 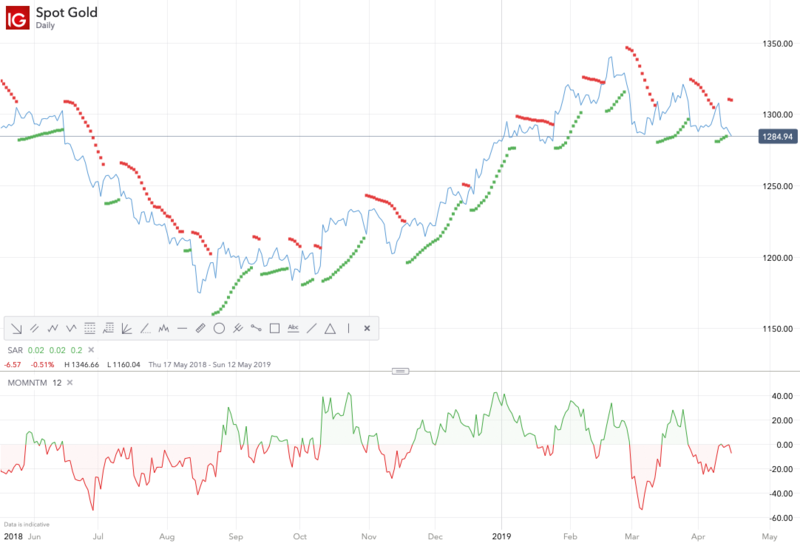 “Price action in gold continues to lend strength to our view that expected data deterioration will help spark a gold rally as interest rates continue to fall in the context of a slowing global economy,” analysts at TD Securities wrote in a note." "When America sneezes, the rest of the world catches a cold". From an economic perspective, lower interest rates will reduce the opportunity cost of holding gold which is non-yielding and it will weigh on the dollar. If one looks at the 'Monthly', 'Weekly' and 'Daily' charts for Silver then one may realise that it is still in a long term downtrend. Silver's longer term price action is much weaker than Gold's. Gold on the other hand is showing far more resilience long term as the monthly, weekly and daily charts indicate. It is also still trading above its 20, 50, 100 and 200 DMA and none of the curves on the 'daily' are sloping downwards. This is a positive indicator. My thread Bonds and Gilts is actually nicely linked to this thread. Bonds and Gold seem to be moving upwards together at the moment. A lot of investors either ignore bonds in their investment portfolios or try to allocate capital after the majority of capital has arrived meaning they can be left with capital losses as a result. Both Gold and Silver have experienced sharp price declines. This is a critical correction as Gold has gone below its 20, 50, and 100 DMA which indicates to me a bearish phase. The key level for me now is its 200 DMA which is around the $1250 level on the 'daily'. It is possible for Gold to go down and test this level so a short trade right now is certainly on. Silver on the other hand is falling harder than Gold which is expected. It is also trading below its 20, 50 and 100 DMA which again is a bearish signal. However, what is more importance is how close it is to breaching its 200 DMA on the daily which is around the $14.93 level. This does not bode well for Silver short term. Again there is a short term trade here for those who are interested. No potential 'long' Gold trades at this juncture. No potential 'long' Silver trader at this juncture. What we are seeing is the US Dollar strengthening and this seems to clearly have impacted both negatively Gold and Silver. Both Gold and Silver (daily charts) are weakening. I love IG's timing. Exceptional! Gold is down 1.35% and Silver is down 2% at the time of writing. Both look bearish since around the middle of February 2019. Now an uptrend in Gold may be around the corner but for now there is no Potential 'Long' Gold Trade based on current price action. I think with UK Brexit being delayed combined with the US Dollar has it has acted as a negative driver for Gold prices. It is trading below its 20, 50 and 100 DMA. 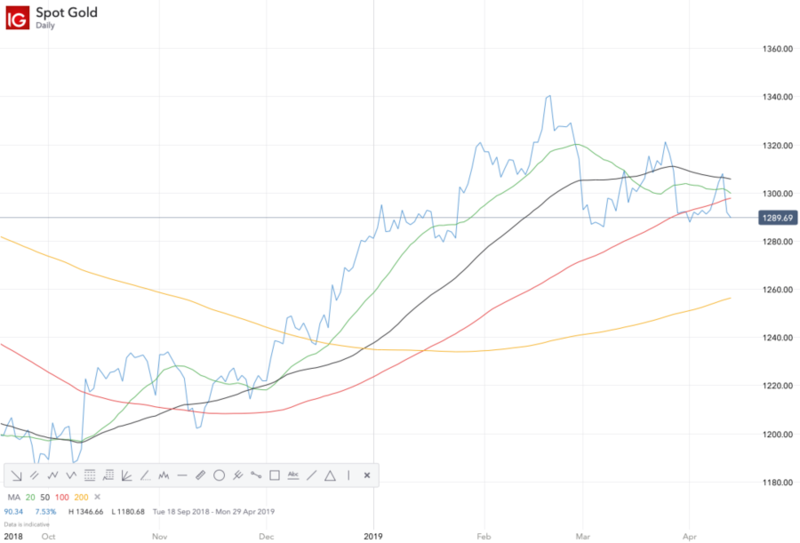 The $1256.35 level represents its 200 DMA on the 'daily' which will be a key price point for Gold to defend should it continue its path downwards. There is no amount of 'waffle', predictions, projections or technical analysis that can change price action currently. It is price action that creates the results which can be used for technical analysis and not the other way around. No amount of charts, lines, more charts and more lines can alter the price action in the future. The price is not obliged to move on my assumption, my projection, my prediction, my opinion, my analysis and my charts. Price answers to no one. Therefore following the price action is a key element when trading not just Gold but any asset. For me there is still no potential 'Long' trade for Gold at this moment in time. If anything one may consider a short. It is not something I personally would short right now as there are better trending shorting opportunities than Gold at the moment. For me Gold is showing weakness and this could be a healthy correction before another move upward resumes. I do not know. What I do know is that Gold is showing bearish signals and the trend is not upwards right now when looking at the 'daily'. This may be a shorter term trend downwards or it could be deeper. Again I do not know but right now the price action is showing weakness. The momentum is indicating bearishness. It has gone below 0. Just how far it goes down will be of most importance to Gold traders. The Parabolic SAR is signalling the threat of a trend change. Once it goes below the dots then it may indicate a potential trend change, especially if the price action continues to go downwards.